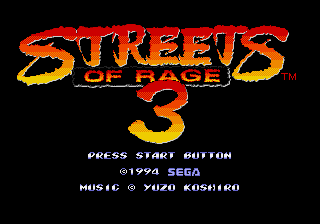 Streets of Rage 3, called Bare Knuckle III (ベアナックルIII) in Japan, is a side-scrolling beat 'em up released by Sega in 1994 for the Sega Mega Drive. It is third and final part of the Streets of Rage trilogy, and a direct sequel to Streets of Rage 2. City of Wood Oak recently experienced a catalysmic event. An experimental weapon called "Rakushin" detonated in the city's suburbs, causing the deaths of 30000 people and wounded 80000 more. Alarmed with this terrifying event, Police Department assigns two of their top detectives, Axel Stone and Blaze Fielding, two of the heroes who saved the city in the past, to investigate the incident and bring those responsible to justice. Meanwhile, tension rises in the Lima Region, inhabited by a number of nations looking for an excuse to start a war. One of the representatives of the Lima countries, General Ivan Petrov has been invited to the White House for peace talks but now he is reported missing. Soon after these events, Axel and Blaze were contacted by a mysterious man named Gilbert Zan, who claims to be the man who invented the Rakushin. Zan claims that his research is being used by the powers who intend to use it for destructive purposes. But can he be trusted? Is the horrible attack that took place in Wood Oak City somehow connected to the conflict brewing in Lima? Why General Petrov is missing? Timing is very suspicious. Is someone using the Wood Oak City as a testing ground for their new weapons? Are Lima countries potential buyers? Too many questions, too little time. Every second wasted brings the city one step closer to disaster. Lives of the citizens under your protection, and possibly, millions of others are hanging in balance. Bring the situation under control. Streets of Rage 3 aimed to build on the success of its predecessor, so while the style of gameplay and control scheme is largely identical to its predecessors, significant changes were made to the overall structure of the game. Streets of Rage 3 is a faster paced release with longer levels, a more complex plot (which in turn leads to more in-depth scenarios complete with interactive levels and multiple endings) and the return of traps such as pits. Dash and dodge moves were added to each character's arsenal of moves, and weapons can now only be used for a few times before breaking. Changes to the fighting mechanics allows for the integration of weapons with certain movesets. Team attacks, absent from Streets of Rage 2 but available in the original Streets of Rage, make a return, and are occasionally used by enemies too. Blitz moves, performed while running, have also been altered and are now upgradable over the course of the game (predicated on how many points are earned per level). Death causes a downgrade, however holding the button before a series of button combinations can give players access to the upgraded moveset at any point in the game, at the expense of the time taken to perform attacks. Enemies are also smarter with weapons, and some can even steal health upgrades, and there are also several secret playable characters, unlockable after overcoming certain conditions during the game. Special moves also no longer drain the user's health - a separate, automatically regenerating bar is introduced for this purpose. Either by design choice or oversight, back attacks ( button or + button) give a very high amount of score in relation to the damage they do. Score focused gameplay therefore focuses on (ideally only consist of) back attacks. This is different from the prequel, where throws gave the highest amount of score. You barely stopped the second bomb from exploding but there is still a lot of work to do. Fight through warehouse, waterfront and fight back a "fabulous" new enemy. Your nemesis Shiva is waiting for you at the end of the level. Go through the most dangerous parts of the city during the night time and reach the Atlas Disco. Your old "friends", Onihime and Yasha is back for a rematch, this time wearing their own original attire. Axel is framed for the kidnapping of General Petrov, but at least you have a lead. Reach the top of the building under construction. At the end, you will find out that Syndicate's robotic technologies are much more advanced than you imagined. Only way to find General Petrov is to go through the secret underground path Syndicate uses as a supply route. Watch out for small automated wagons that will pass through the area. At the end of the level, a trio of ninja mercenaries will try to stop you from reaching your target. You are only few steps away from rescuing General Petrov. Fight back waves of enemies and face off Mr.X. Be careful for last minute surprises from the criminal mastermind. Time is running out. You must locate and destroy two switchboards that power up the barriers denying access to General Petrov's cell. First switchboard is located in the cell 3 in the middle floor, while other one is located in the cell 2 in the lowest floor. Quickly reach Petrov who is located in the middle floor. Hurry up! Poisonous Gas will be released soon. You are almost at the end. Enter the abandoned factory in the Green Leaf district and "retire" Mr.X's robot army. Mr.X is waiting for you at the end with his state of the art prototype combat robot. If you fail to save Petrov, this is where you will end up. Mr.X may have gotten away but at least you can still prevent Syndicate from starting a war that will claim the lives of millions. Find and arrest Petrov's impostor. Prototype screenshots show that at one point, a motorcycle stage was planned for Streets of Rage 3, with some leftover code being present in the final game ROM. It is unknown why this feature was axed. In comparison to its predecessors, Streets of Rage 3 takes a radically different approach to its soundtrack. Though still composed by Yuzo Koshiro, it is heavily influenced by Detroit's hard techno scene, popular in Tokyo dance clubs of the time. The soundtrack gathered a mixed reception in 1994, though is retrospectively considered by many to have been ahead of its time, containing elements similar to the "trance" era of dance music which would grow in popularity in the coming months and years. Koshiro developed a composition system for this game, called the "Automated Composing System". Using features such as a random note generator (programmed in C++) , the soundtrack has a much more experimental tone, particularly noticeable in tracks such as "Bulldozer", whose composition is almost entirely randomised. Like its predecessor, Motohiro Kawashima also contributed to the game's soundtrack. There are several inside jokes in the game. In the overseas versions, Axel screams "Bare Knuckle" during his blitz (running attack). Bare Knuckle is the original japanese name of the Street of Rage. Boss of the 4th level, Yamato yells "Mijin" when defeated and blows himself to pieces. This is a reference to a ninja magic in Revenge of the Shinobi and Shinobi III, which has same animation and name. Unlike its Shinobi version, Yamato's Mijin does not help him to defeat the heroes. Streets of Rage 3 is a controversial game among many thanks to Sega of America's heavy-handed localisation policies of the era. Unlike previous releases, the differences between Bare Knuckle III and Streets of Rage 3 are extremely obvious, involving the removal of features, a vastly different story (riddled in plotholes and missing scenes) and a higher level of difficulty (made worse by the fact that on the "easy" setting, the overseas release will stop after stage 5). Reasons for this massive spike in difficulty for overseas versions is unknown. Of particular note is the use of "gender neutral colours" (whatever that means) amongst the character sprites, which leads to inconsistencies with both Streets of Rage's cover art (in all regions) and the designs in previous games. Scantily clad female characters were covered up an entire miniboss (Ash) was removed due to his perceived homosexuality. These and other changes ultimately hurt critical reception in Europe and North America, with some reviewers urging Streets of Rage series fans import Bare Knuckle III or skip this title entirely. An interesting thing to note is the cover of the EU version, which is actually used by Mean Machines Sega magazine which featured the game. Sega of Europe loved the cover art so much, they purchased the rights to use it for the EU version's packaging. Today, an unofficial fan translation is available for the Bare Knuckle III ROM, whose script was used with the permission of the original author. Other hacks bring back the lost motorbike stages and additional areas of round 6 which were originally removed in the western releases of the game. Compared to its prequels, Streets of Rage 3 is a less common and more expensive game to find in its original Mega Drive form. It has, however, been released for the Japanese version of Sonic Gems Collection for the GameCube and PlayStation 2. The game also appeared in Sega Mega Drive Ultimate Collection for Xbox 360 and PlayStation 3. The game has also been released on the Wii Virtual Console, iOS and Steam. The iOS version was removed from sale on iTunes in 2015. Main article: Streets of Rage 3/Changelog. Main article: Streets of Rage 3/Magazine articles.